Summertime brings many pet owners and their pets outdoors for some fresh air, exercise and adventure. With the heat rising and insects buzzing about, some great products are a necessity for your doggie first aid kit. Whether you are hiking with your canine companion or going for a leisurely stroll at the local dog park, keep these items close at hand to make the time outdoors more enjoyable for you and your dog. Dogs get to run around with a fur coat on in blistering heat and can not sweat to cool themselves down as humans can. Your dog will start panting, their eyes may become bloodshot, and when you pull gently on their skin, it will take longer to go back to its original state when dehydration sets in. Purchasing a dog vest that can carry a bottle of water is an excellent way to cool down your pet and make them feel important for carrying things. You can also pack a few cotton balls and some isopropyl alcohol that you can dab onto their paws for added relief. Just don’t use too much, for it can dry out their pads. Keeping insects at bay is tough for even humans, but there are products on the market like Pet-Tek All Natural Paw Balm that will help keep those pesky critters away from your pet. This product is safe to use on ears, nose, paws, and skin so that you can slather it on and the Lavender oil with repel bugs. The organic virgin coconut oil is perfect for most topical pet issues, and the beeswax creates a water resistant and skin protecting barrier. Pack this product for both a repellent and a topical remedy when you are out on the trails. 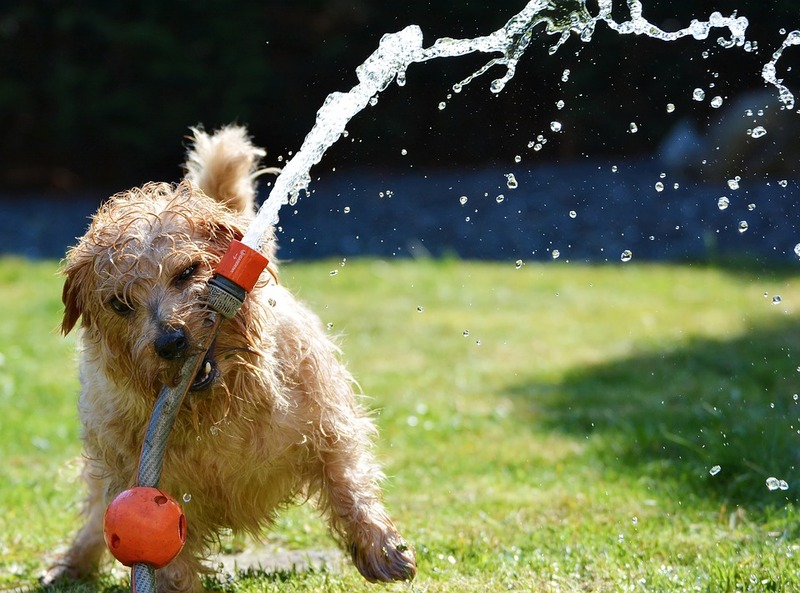 Grab an inexpensive kiddie pool at your local big box or hardware store and let Rover enjoy cooling off in some refreshing water. Dogs need us to help them when it comes to hot temperatures, and this is a fantastic way to show Rover just how much he means to you. Going for walks in the early morning or later in the evening is beneficial for your canine. The temperature has not spiked yet, and walking will be much more enjoyable for your dog when they are not overheating. Try out one of these durable leashes for the perfect accessory to your walk. Keeping your dog healthy during the winter time with supplements that will help with energy levels and overall health is a smart way to make summertime fun for your dog. Preventative measures make for healthier moments with your pet. One of the best ways to keep your pet healthy and hydrated is with electrolyte products. Pet-Tek carries Electrolyte Replenishment Formula that helps keep your dog in tip-top shape and hydrated along the journey. This product helps your dog maintain a healthy fluid balance, keeps muscles relaxed and helps maintain normal blood pressure levels. Enjoy the summer months with your canine and put together a package that you can carry on your outings to keep your dog healthy, hydrated and safe.